The AOM Specialized Conferences Initiative features a portfolio of smaller, meaningful and sustainable new meeting opportunities that complement our historic Annual Meeting. Several conference models will allow members and participants to connect and engage throughout the year, virtually and in varied locations, that are reflective of the geographic dispersion of our international membership. Big Data and Managing in a Digital Economy Our first thematic conference was held April 18-20, 2018, at the University of Surrey, UK. From Start-up to Scale-up Strategies: Coping in a Volatile Business Environment Our next thematic conference was held from December 17-19, 2018, in Tel Aviv, Israel. Responsible Leadership in Rising Economies Our 2019 conference will explore how the academic community partners with businesses, policy makers, NGOs, media, and others to develop responsible management and sustainable innovation. 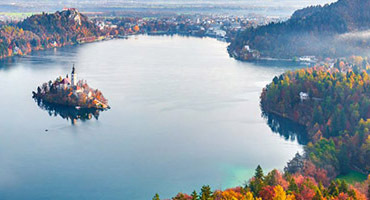 It will be held October 23-25 in Bled, Slovenia. In addition to these conferences, new ideas that reflect the creative energy of our membership are expected to emerge, as the Academy experiments with new program structures, delivery modes, content features, and conference designs. From Start-up to Scale-up has successfully concluded! Our conference in Tel Aviv, Israel, the 'Startup Nation', held December 17-19, 2018, was the second small conference of the Small Conference Initiative. 400 attendees came together from 34 different countries for 3 days of presentations, active learning workshops, and panel discussions that provided key learning and networking opportunities. 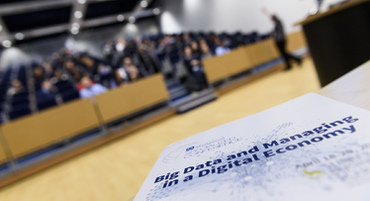 Big Data and Managing in a Digital Economy was the first in a series of specialized conferences, to be held in various locations across the globe. Thank you to all who participated! Following the recent financial crisis, and against the background of international political and economic turmoil (e.g., Brexit), policy makers and practitioners face the important challenge of revitalizing and stabilizing the volatile economy through effective innovation policies and strategies that incentivize entrepreneurial efforts. This conference provided a unique opportunity for identifying key challenges, discussing implications, and developing suitable strategies. The conference offered several interdivisional paper sessions on a variety of topics (e.g., the international expansion of hi-tech startups) that combine perspectives from Organizational Behavior, International Business, and Technology and Innovation. Responsible Leadership is the topic of much debate in both academic and practitioner circles. Critics have pointed out that management education and scholarship often fail to develop the critical, creative, and socially relevant and responsive mindsets that are required to transform businesses and society, and to solve global challenges while being locally responsive. This AOM Specialized Conference looks at what “responsible leadership” means in the context of a rapidly changing world, particularly in rising and transforming economies. We also seek to explore how the scholarly management community, in collaboration with businesses, policy makers, NGOs, media, and other stakeholders interested in the new role of business in society, could best support the development of responsible management and sustainable innovation. The Academy of Management’s Specialized Conferences Committee is currently inviting brief statements of interest from potential host institutions and local organizing committees to develop an AOM Specialized Conference to be held in 2020 or beyond. The Specialized Conferences Committee will accept brief preliminary proposal forms on a rolling basis. The ideas that generate the most interest will advance to a second stage of development. The committee will then collaboratively work with these finalists to more fully develop final proposals. Proposal Submissions will be accepted on a rolling basis.